"Oflameron" – one of few table games represented in different variants: with playing cards, on a sheet of paper (see here), with playing boxes, etc. Any of these variants is easy to create independently from available materials. Images of playing cards or a playing table may be downloaded from the web-site for free and printed out, playing cards can be scissored out of any paper, ranges of playing boxes also may be printed or drawn with markers on a sheet of paper. To draw a game just 2-3 colored markers and a surface for drawing (a large sheet of paper, cardboard, plastic) are needed. To start the game, each of the participants should place any MARKER (any selected symbol – a x-"cross", a 0-"nil", etc.) with a pen in the lower line of the table, in any box, of the form. 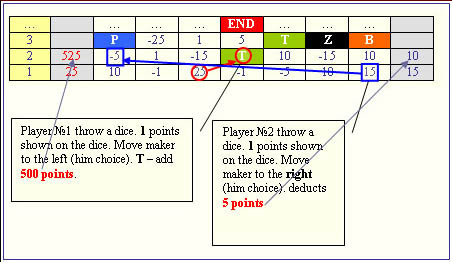 After than, each player throws the game-cube (dice) and moves his or her marker (draws it again) to the NEXT UPPER LINE, by shifting it TO THE RIGHT or TO THE LEFT by such number of boxes as fell on the cube. You choose the directions of shifting the marker (to the rights or to the left) yourself, depending on what is advantageous for you. [-1,-5,-10,-15,-25] - deduct the indicated points from your account. [1,5,10,15,25] - add the indicated points to your account. [B] - deducts 200 points from your account. [P] - adds 100 points to your account. [T] - adds 500 points to your account. [Z] - zeroes your account. [END] - ends the game. As an example, a portion of the game form, a screen shot (the three lower lines - Level1-Level3) is provided here. Columns for the first (on the left) and the second (on the right) player are marked in grey. The yellow column shows the current game level. First step ... Choose any cells in the lower line of the table and put your marker on it. Next step ... Throw a dice. Move your marker along the next line of the game table to the right or to the left (for your choice) for a number of boxes shown on the dice. This drawing shows the lower right corner of the game form – level numbering column |Level| and count column |Count|. The game rules are quite easy – one can learn to play in a few minutes. However, the game not as simple as might seem. You should try to increase your account. Each of your steps leads to the marker going one level up. 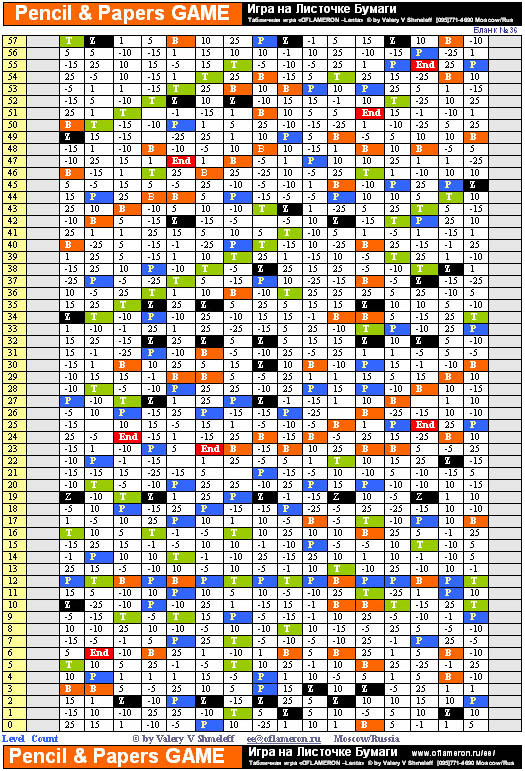 The number of moves to the right/left is determined by values that fell on the game-cube. What should I think over here? Deduction, addition, and prize boxes are distributed unevenly: forecast your moves on the basis of density that some or other values in boxes are distributed with. Moreover, one can use the game-cube of 1-3 range (instead of 1-6), which will allow you to better predict strategic implications of your moves. Example. During the game, the number of boxes in the direction you chose may turn out to be less than the figure that fell on the game-cube. In this case, you make the missing moves on the opposite side of the level |Level|. As an example, shifting is made by 3 boxes to the left on the figure. The goal of the game is to get as many points as possible, i.e. to maximize one’s account. Before the game begins, conditions of ending the game must be stipulated. The game may be over when all levels on one form have been passed. But in principle, there are no limits on the game duration, and you can continue the contest by attaching the next form to the top of the previous one. 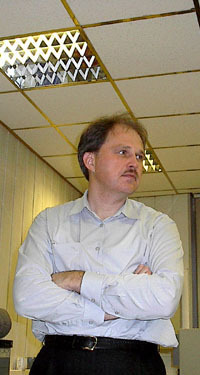 The game may be over when a player gets any earlier specified number of points. The standard end of the game is when one of the markers gets in the [END]-marked box. Of course, it is advantageous to end the game deliberately when your account is well over that of your adversary you can end the game forcedly and get your prize. The form is intended for color printing. Download the file in MS Word and print out 1 page on a color printer. Do not be distressed if you have no color printer. Colors of the form were selected so that its “black and white” copy will be also good (print it with the maximum number of grey shades). A "black and white" form can be reproduced more easily. When you start a game you chose where to put your marker on the lower level – it is your right. Any further moves depend on the number of points that fell on your game-cube. So, even playing on several identical forms several times, you will play different games. Free handmade board game on paper. Free board game. How to make with your own hands.